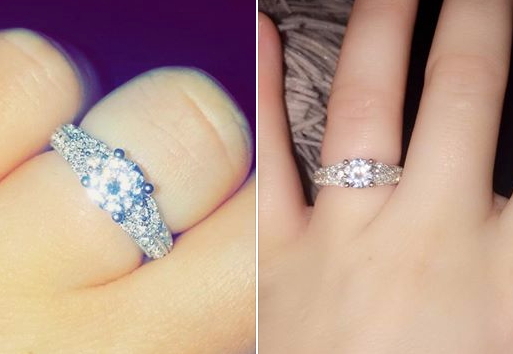 I saw on Facebook this morning that a Maine woman had lost a beautiful white gold engagement ring with diamonds on Popham beach (Maine) on Saturday. It's now Monday, so I contacted her and offered to go look for it. Needless to say she was distraught, and I could only offer about a 5% chance of finding it. On my way to the beach I stopped in at the county sheriff's office to drop off the live rounds I have dug up at the flea market site so they can dispose of them safely. (Sorry no picture). The staff and chief deputy Brett always welcome me warmly, he's a fellow detectorist, and they have all seen and enjoyed the TV show: "Detectorists". I chatted with Brett a bit and we have agreed to go on a hunt together soon. I'll share that experience on this blog after it happens. 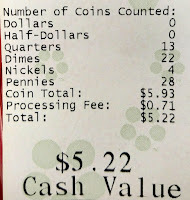 I also stopped at the grocery store to cash in my dug coins at the Coinstar machine. 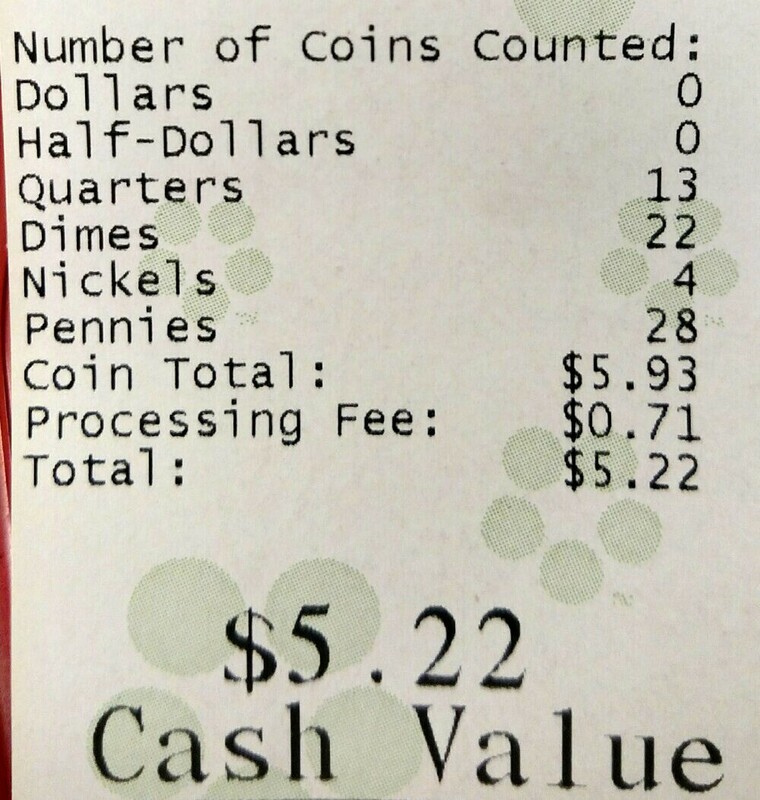 I got $5.22 after their fee, and this is for about 1 week of digging. Not bad! Armed with pictures of the lost ring I located the area whereit was lost. Apparently the woman had stopped to put sun lotion on her child and took her ring off and left it on the shade of the stroller. It has been 2 days since she lost it, but I figured there was a chance I could find it as it would present a strong signal. Here's a shot of the area where she lost it. 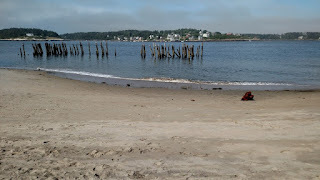 I gridded off the area in my mind and did a search pattern walking away from and toward the water swinging parallel to the water to reduce false signals from varying densities of wet/dry sand. My ACE 300 is not optimal for this search, but I learned that it was quite capable of detecting even a tiny brass washer about 1/4" diameter that was over 3" deep. Here are the finds - no ring! I called the gal a few times to be sure I was in the right area and sent her the picture above to confirm. Each time I got her hopes up, but no luck. Maybe someone else will find it? Here's what I did find. I looked for 4 hours in the afternoon. 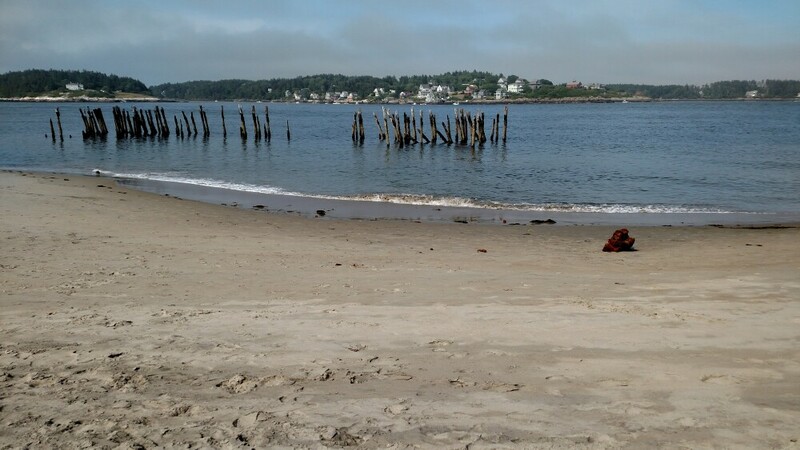 The beach was not too crowded and I think I have a slight sunburn but I enjoyed being out there. Actually I had planned to come out sometime after July 4th to see if I could find fresh spills. The first good signal I dug yielded a 2007 P George Washington One Dollar coin in pretty good condition. Definitely a first. I don't think I have ever seen a dollar coin in person before. And right next to it was this small silver earring, I wonder if there is a story there! Beach hunting is quite different from what I'm used to. At the flea market I get signals every foot or 2. Here, I walked hundreds of feet with not a peep. But when a signal did show up there was definitely something worth digging. I also got a few nickels, a square brass nail and washers. And another lead fishing weight. My lead recycling bucket is getting quite heavy!